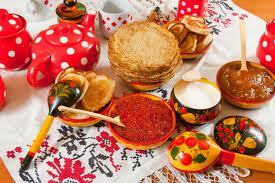 Tomorrow begins one of the most ancient holidays of Russia - Maslenitsa. Its origins trace back to the earliest Slavic heathenistic history. 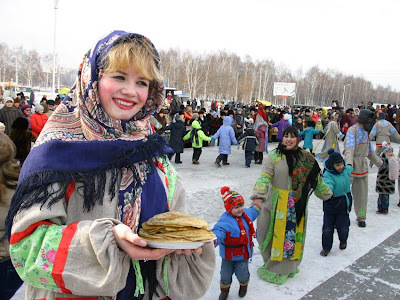 Maslenitsa is a holiday of Winter's send-off and Spring's welcome. 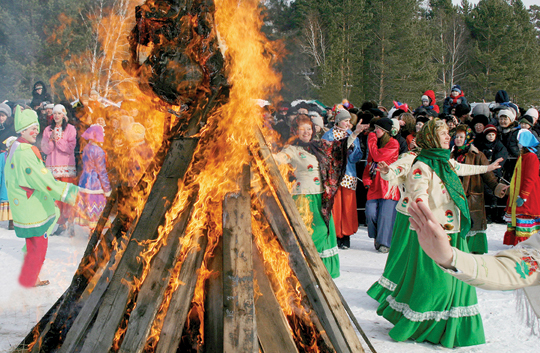 This holiday was timed to the Vernal Equinox, which ancient slavs counted as the new year's eve. Maslenitsa lasted for a whole week, and multiple entertaiments took place in its course: fisticuffs, the Snow Town Siege (it symbolized the besieging of the Winter realm), Maslenitsa's scarecrow burning, sleighing, troika (the three-horses-harnessed sleigh) riding, newlyweds shows, and lots of pancakes! Ancient slavs loved pancakes of all kinds no less than their contemporaries: simple butter pancakes, fish pancakes, sweet honey or jam pancakes, delicacy caviar pancakes - tons of these were eaten during this happy week. 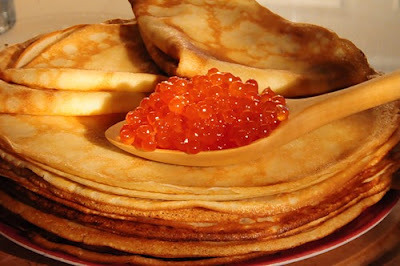 Some believe that the pancake itself represented the sun - the main symbol and weapon of Spring in its eternal confrontation with Winter; but that seems to be a false hypothesis: in the Slavic culture pancakes were the commemorative course. 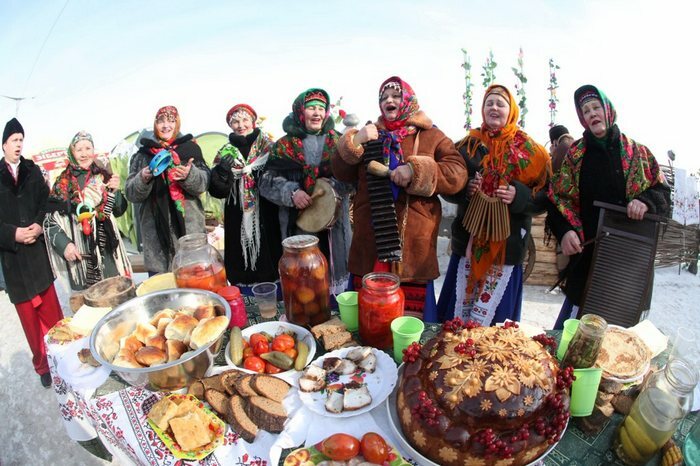 It seems that people commemorated their ancestors during the Maslenitsa week. On Monday morning father-in-law and mother-in-law sent their daughter-in-law to spend the day with her parents, and visited their family in the evening. The snow hills, snow town, marketplaces, and other places for festivals and merrymaking were finished by this day. The pancake cooking started: the first pancake was contributed to the poor for commemorating of the lost ones. The Maslenitsa's scarecrow was constructed of straw, thatch, old clothings, and other scraps. It was mounted on the pike and carried in a sleigh throughout the town streets. Bride shows took place on that day. Single men were invited to watch the brides, to sleigh the snow hills, and, of course, to feast upon pancakes. On that day the son-in-law visited his mother-in-law to taste her pancakes. Other guests were invited as well. The main Maslenitsa's part started on that day: the everyday work stopped, and the merriments reached maximum. Townsfolk gave theirselves to multiple entertainments: horse riding, fisticuffs, different competitions (that were finished in wild parties). The main thursday's action was the Snow Town Siege. The purport of The Revelry was splashing out all negative energy accumulated during the winter. In the evening people sang merry songs and jumped over the fires. Needless to say, all of this was accompanied by pancake feasting. Mother-in-law visited her son-in-law with her relatives and friends in a return visit. Wife cooked pancakes that evening. Son-in-law had to show his loyalty to his mother-in-law that evening. On that day all young family women got together to chat and communicate and eat pancakes. 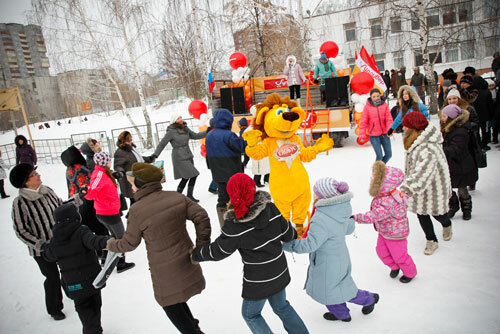 The Send-Off is the culmination of the Maslenitsa week. People ask each other's forgiveness for different troubles and offences of the past year; they visited graveyards to commemorate the lost ones. People visited Banya (Russian sauna) on that day. In the holiday's end Maslenitsa's scarecrow was solemnly burned and its ashes were scattered over the fields (that was believed to fertilize the land). Maslenitsa had always been a holiday whose main pupose is to strenghten family bonds, to splash out negative energy, and to celebrate Spring's coming; so it is nowdays - many Russian people celebrate every day of Maslenitsa week, and in the weekend main activities like Snow Town Siege and Maslenitsa's scarecrow burning take place every year. If you are lucky to be in Russia on Maslenitsa, do not hesitate to visit the celebrations!